Rome, Italy - November 1, 2016: Baroque-style Fontana della Barcaccia (Fountain of the Ugly Boat) and crowd of tourists on Spanish Steps on Piazza di Spagna in Rome city. Rome: Rome remains one of the most popular destinations for tourists in Italy. As officials of the city are looking to promote the growth of Rome’s tourist industry, the city government announced this week it was developing plans to attract more visitors from China. 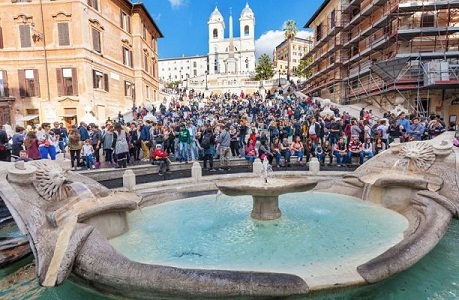 Carlo Cafarotti, Rome’s accessor for tourism and a key advisor to mayor Virginia Raggi, said the goal was making the number of Chinese tourists among the top five ones of foreign visitors to Rome by 2022. Cafarotti said that there is a natural connection between Italy and China, both homes to ancient culture. “We are exploring ways to open the door further and to welcome more Chinese visitors,” added Cafarotti. Rome attracts more than 30 million visitors per year, according to figures from Cafarotti’s office. Around one of every 20 visitors are from China. Rome’s city government has been working on plans to boost the number of Chinese tourists, ranging from promotions on China’s popular WeChat digital communications platform, to Chinese-language videos promoting top spots in the city, collaboration with Chinese travel services, and more Chinese-language options at top museums and other tourist venues. The accessor for tourism noted there are more direct flight connections than ever between Rome and cities in China, making travel easier. “It is important to attract new visitors, but it is just as important that they return home and spread the word about what the city has to offer. The most effective kind of promotion for any kind of trip is word of mouth,” added Bolognesi. Andrea Giuricin, a tourism sector analyst and a professor of transport management at the Cesisp research facility at the University of Milano Bicocca, said Rome’s focus on potential Chinese tourists makes good strategic sense. Giuricin added that the Chinese market has enormous potential.